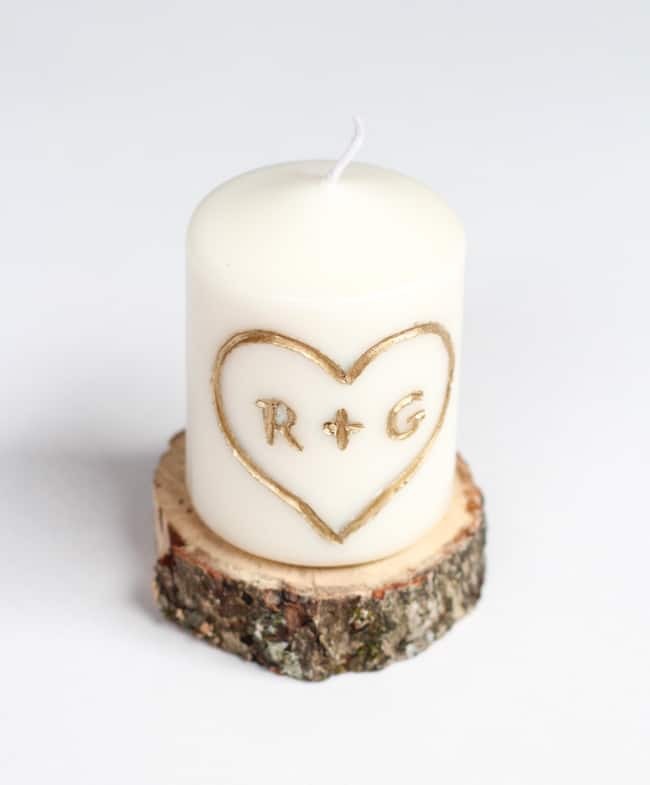 This DIY candle carved with initials is easy to make and it makes a great personalized, handmade gift for everyone in your circle. It might feel like all the holidays are behind us, but Valentine’s Day is right around the corner. As much as I love covering everything in red and pink, I find it difficult to get excited about shopping so quickly after Christmas. 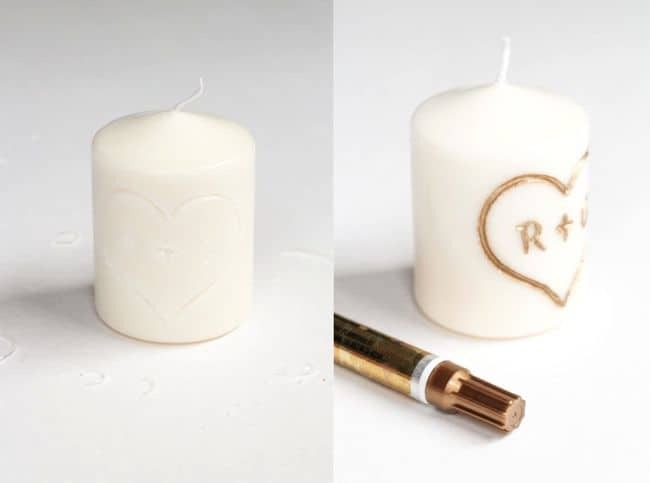 What better way to show that special someone you care than by making them a gift? 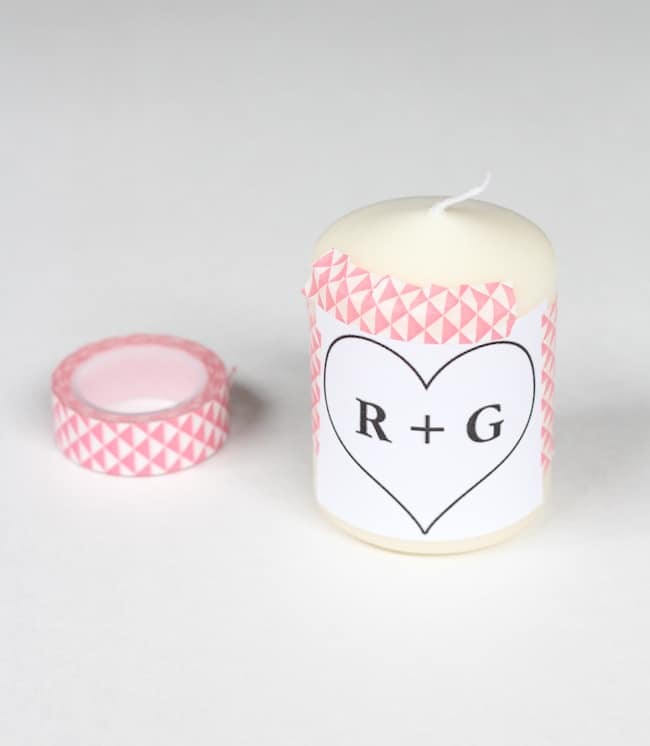 Because nothing says endless love like carving your initials into a candle! 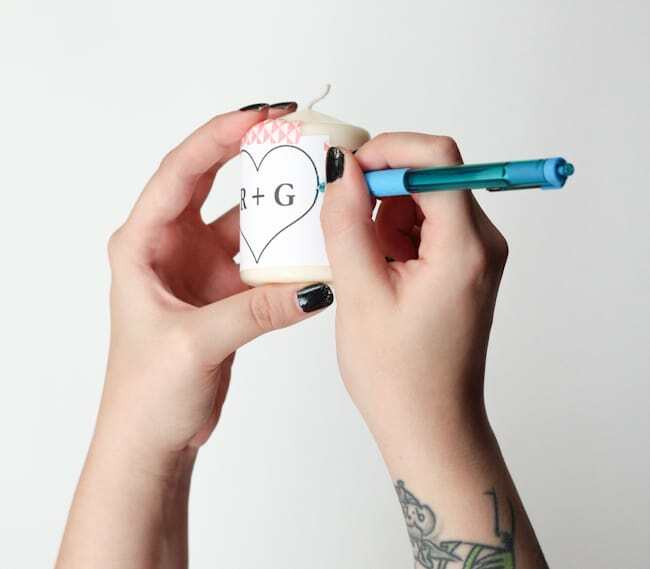 Start by taping your design to a candle. You don’t want it to slip when you draw over it! You can freehand the design or make it in Photoshop if you need more of a guide. I used the unique shape tool in Photoshop to make the heart and Garamond for the font. Firmly trace over your design with a ball point pen. This will make the initial path you need for carving, so be extra careful. Go over your initial tracing with the linoleum cutter. The line should be wide and deep enough to fit the tip of your gold leaf pen. Go over the inside of your carving with a gold leaf pen. You may need a second coat to achieve the level of gold you want. Let dry and gift to your sweetheart. Not the lovey-dovey type? Try carving stripes, zig zags or any other geometric shape instead! 52 Weeks Project when overwhelmed with work and in need of a creative outlet. When she’s not pinning pictures of diy projects or brushing glitter out of her hair, you can find her exploring and photographing the Bay Area. This will surely win the heart of your love one. 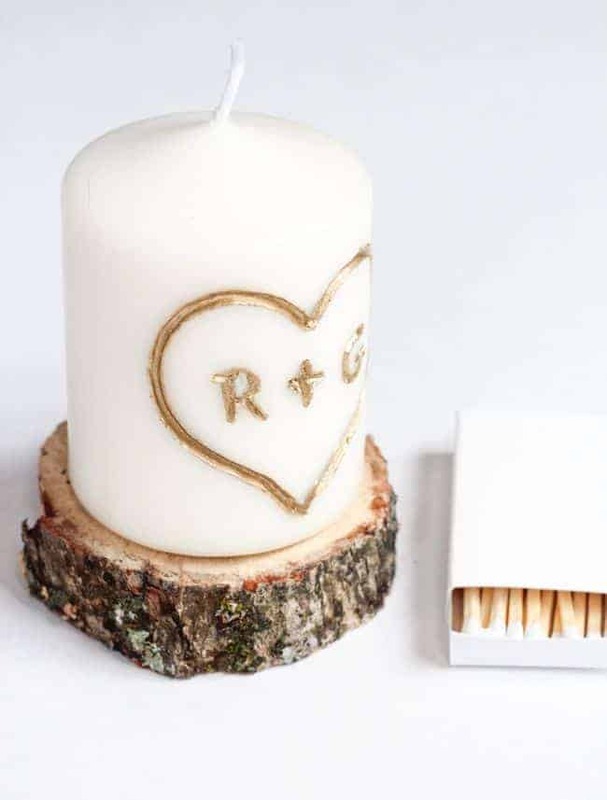 Hi there I am looking for someone that is able to carve a face in a big candle like a status but mini statu of my sis in law and brother as they are getting married and want to get them that for their weadding like their face and date of weadding if you are not able do you know anyone that is able to do this? Where do i buy a cutter in aus? Hi Rachel! 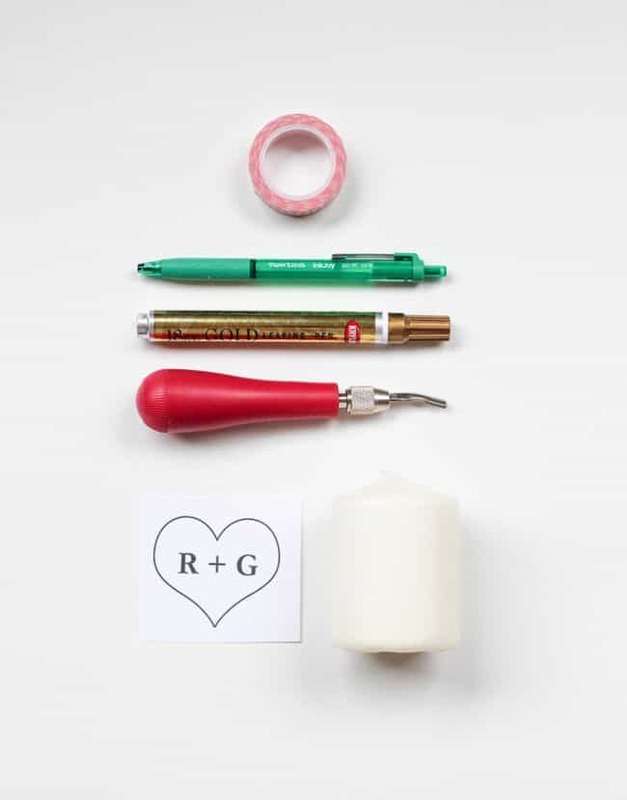 I want to share your post on a roundup I am doing on my blog for a roundup of DIY gifts for him/her on Valentine’s Day. Is that okay? I will use your picture and tag your blog with the post linked to the picture. Let me know! Sure, go for it, thanks Nia! This DIY project looks great! May have to try this one out for Valentine’s day! Is there a substitute for the linoleum cutter? I don’t have one nor do I know where to get them for cheap. Are there any safety concerns with burning the Gold Leaf from the pen? Where do you get the tree bark decor? Is the pen not flammable? Does that not make it dangerous? I want to use a sharpie but am worried it’ll combust or something when the candle burns. No it’s only somewhat flammable because of the fumes so after it dries there’s no issue :) I’ve used acrylic paint as well as paint markers and never had any incidents. Hope that helps! I, too, am wondering if you can use a regular paint pen or paint with a fine brush so that you can add color. The possibilities are endless and this is something I will definitely be doing. Thank you! yes you can! I use acrylic paint on one’s I’ve made in the past! What can i use if i cant get my hands on a golf leaf pen? What can I use if I don’t have a linoleum cutter? What a beautiful idea! Are these more for decorative purposes, or can they be burned like normal? 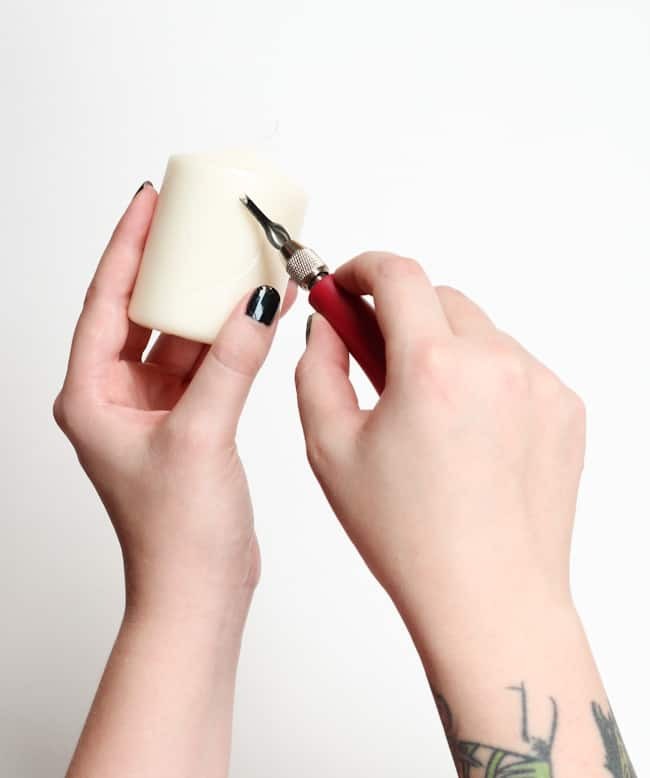 if you dont have a linoleum cutter and are using a soft candle, you may be able to get away with carefully using a pen cap. you might have to go over the design a few times though. Pretty sure these will be integrated into my wedding’s centrepieces. So cute! Thanks so much. What a great idea Kerri! Handmade touches at weddings are always a beautiful idea! What a clever idea! I love the personalized touch! This is such a great idea! Would make a wonderful centrepiece for a wedding too! What a beautiful idea Stephanie! I LOVE THIS!! Im a sucker for initials + initials on this, so Im totally sharing this.